Dr. Kamil Agi, Chairman of SensorComm Technologies, was quoted in the December 2015/January 2016 issue of What’s New In Process Technology. 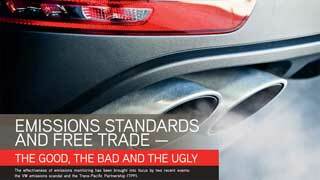 EMISSIONS STANDARDS AND FREE TRADE: THE GOOD THE BAD AND THE UGLY. The effectiveness of emissions monitoring has been brought into focus by two recent events: the VW emissions scandal and the Trans-Pacific Partnership (TPP). QUOTE FROM DR. AGI: “Emissions Standards and Free Trade” The Good, The Bad and the Ugly” It appears that all software-controlled machinery can be prone to ‘cheating’. One way to combat this could be to make the software source code accessible to the public. Dr Kamil Agi, CEO of SensorComm Technologies, believes that loT smart emissions monitoring could be part of a solution to deter any other ‘VW-type’ situations. His company has developed a wireless loT-based automotive sensor that measures NOx emissions at extremely low levels (sub-ppm) with real-time measurement and cost-effective monitoring capabilities. The sensor can be tuned and manufactured for specific ranges enabling accurate NOx measurement that facilitates compliance with current and future LEV Ill, TIER Ill and EURO 6 regulatory standards. “The world is rapidly becoming loT based with smartphones, smart homes and smart cars. A natural extension of this will be loT smart emissions monitoring. Had this technology already been adopted by industry and regulators, it would have made Volkswagen’s effort to circumvent air pollution laws completely unnecessary,” said Agi.